We are not here to chronicle the history of Las Vegas, but now that Sin City has become a major tourist and business destination and leading metropolis, having weathered wars, recessions, depressions, anti-gambling crusades, the Prohibition, greedy gangsters, Howard Hughes, Mike Tyson, killer heat waves, floods and nuclear tests, we would like to remind you of a few items on its culinary timeline. When Mormon leader Brigham Young passed through in 1858, he abandoned plans to colonize the valley for lack of basic resources. In 1931, when the Hoover Dam project kicked in, it would have been difficult to find much more than beans and whiskey at the casinos erected in a jiffy to cater to the mostly male workforce, or fried chicken at the Green Shack. We know that when Bugsy Siegel opened the Flamingo in 1946, patrons did not spend their dollars on gastronomic adventures; there simply were no options. In time, casinos took the hassle out of the eating experience and set up the all-too-notorious $1.99 all-you-can-eat buffets. About fifty years ago, the Venetian, an Italian restaurant owned by Larry Ruvo’s family, jumped on the bandwagon, closing two years ago, a few years after patriarch Lou Ruvo passed away. Larry Ruvo, along with partner Steve Wynn, founded the Best Brands liquor distributor in 1970. Several years later that business was sold to Southern Wine and Spirits, now Nevada’s largest wine and liquor distributor, for which Larry is Senior Managing Director. Among restaurants that followed the Venetian were the late-great Candlelight Room at the Flamingo, Luigi’s, Villa d’Este and the Palace Court, which started decent service at Caesars Palace in 1975, closing in April 2000 to make way for the resort’s high-roller villas. Two fine-dining restaurants from the 70’s that remain are Andre's French Restaurant and Michael's, which is reminiscent of the Candlelight Room. Check all Las Vegas restaurant ratings! The culinary revolution started in 1992 with the arrival of Wolfgang Puck, followed several years later by Charlie Trotter, Emeril Lagasse and Todd English. But not everything was a success then. After serious losses, high-rollers would be ushered into dining rooms to be comforted. They demanded thick steaks rather than roast squab, right in the middle of service, therefore posing a great challenge to a gastronomic temple. In the case of Charlie at the MGM, the frustrated perfectionist chef departed… to return later. That room is now none other than the posh and successful Nobhill restaurant, operated by gifted chef-turned-entrepreneur Michael Mina. Our first print coverage of these developments started as a chapter in our 1995 Los Angeles Restaurants guide where Top Toques of 14/20 were awarded to Andre's French Restaurant (closed in 2009), Isis, Pamplemousse, Spago and Tillerman. At the turn of the millennium, Las Vegas had spun some serious dining rooms, which were awarded in our now stand-alone book, The Best of Las Vegas, where the top level suddenly was raised to 18/20 for Picasso; 17/20 for Aqua (now Michael Mina Bellagio); 16/20 for Le Cirque, Lutèce, Nobu, Renoir and Valentino. 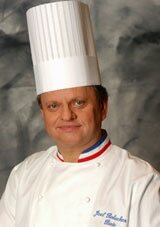 Today we are proud to award a 19/20 to Joël Robuchon at the Mansion, putting Las Vegas on the same rating level as New York (now joined by fellow countryman, über chef Guy Savoy). Not Chicago nor Los Angeles, Paris or San Francisco can brag about such ratings from GAYOT.com today. Alessandro Stratta at Alex, currently with 18/20, is not far behind. Mathematically, if we were to project this growth, there is no doubt that Las Vegas will become Top Restaurant Capital of the World. Top, because there will be more great places than anywhere else. Sure, you won’t have the plethora of bang-for-the buck eateries that Southern California offers or the ethnic diversity that other top towns have. Top artisans are coming from everywhere to practice their art and science. The major difference between the first two waves and today is that the big-name chefs are now actually living in the desert, lured by huge contracts and opportunities. Julian Serrano and Luciano Pellegrini, to name a few, did it then. But now Rick Moonen decamped from New York, Takashi Yagihashi left Farmington Hills, Paul Bartolotta escaped his native Europe and Eric Klein turned his back on Los Angeles. 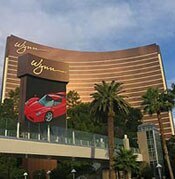 The competition is intensifying, all due to visionary extraordinaire Steve Wynn. He demanded (with one exception in the case of Daniel Boulud Brasserie) that each chef be there at his celebrated, eponymous, just-opened behemoth of a casino complete with Ferrari showroom. You do or you don’t like Las Vegas and what it stands for, but if you consider yourself a devoted foodie, no matter where you come from in the world, Sin City University might be the best school you could ever attend. Bon appétit (once again) but Vegas-size this time. Especially if you're planning on appearing at one of the buffets, which to this day are among the most searched pages on our site! Note: The city of Las Vegas has the highest concentration of Master Sommeliers, actually more than San Francisco and New York combined alone.